The United Nations General Assembly has declared 2019 the International Year for Indigenous Languages. 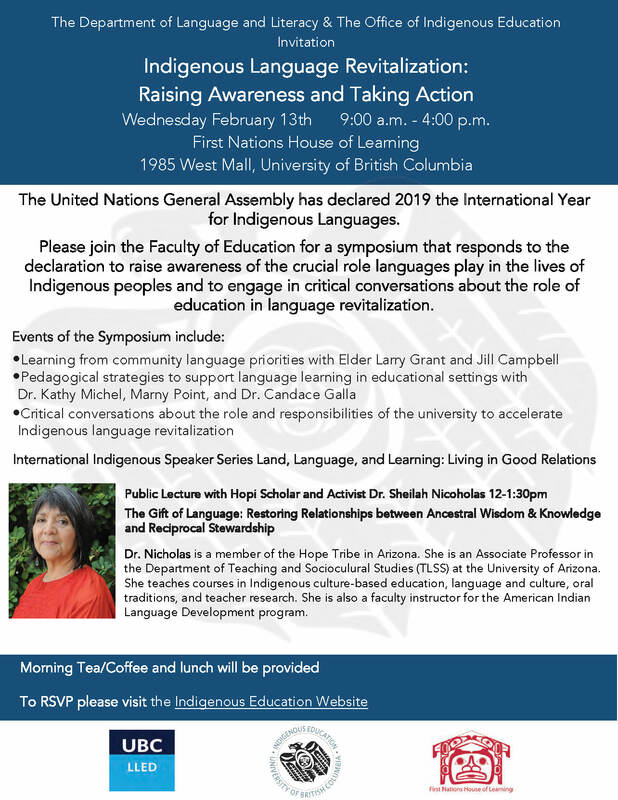 Please join the Faculty of Education for a symposium that responds to the declaration to raise awareness of the crucial role languages play in the lives of Indigenous peoples and to engage in critical conversations about the role of education in language revitalization. Dr. Nicholas is a member of the Hope Tribe in Arizona. She is an Associate Professor in the Department of Teaching and Sociocultural Studies (TLSS) at the University of Arizona. She teaches courses in Indigenous culture-based education, language and culture, oral traditions, and teacher research. She is also a faculty instructor for the American Indian Language Development program. Morning tea/coffee and lunch will be provided. This talk will take place on the traditional, unceded, and occupied territories of the Musqueam people.